Boy, there's something out of one of your nightmares, isn't it? Actually these are Wishniks, one of those fads of the '60s. They were these ugly hard plastic dolls with long hair that you could style or shampoo or pull out or whatever you wanted to do with it. I don't think we had Wishniks growing up. 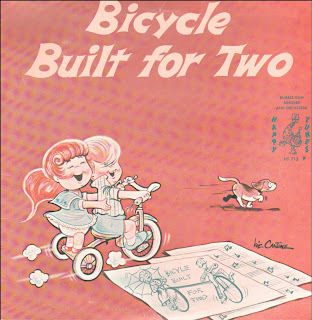 I think we had Trolls, which were sort of a smaller cheaper knockoff of Wishniks. 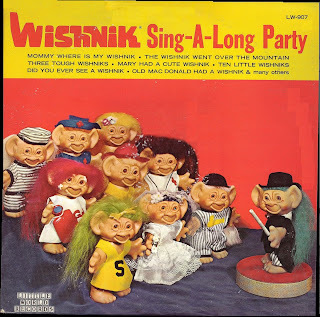 Anyway, here's a record full of Wishnik (or Chipmunk-like) songs, along with some stories presented by Dr. Eric von Newtontootin, the foremost authority on Wishniks. And when they run out of that, there's some generic children's songs to fill out the rest of the album. Enjoy! Mommy, Where Is My Wishnik? Did You Ever See a Wishnik? 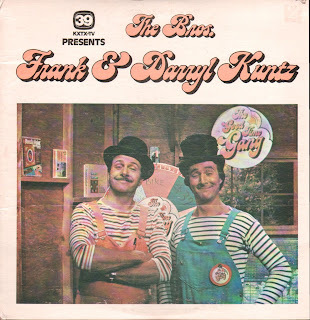 If you watched channel 39 out of Dallas, Texas in the early 80's, you might remember Frank and Darryl Kuntz, the hosts of the kids show "The Good Time Gang". They'd sing songs, give out prizes to kids at home, and even throw a bit of religion into the mix! Here's an album featuring songs and stories from the brothers. Enjoy! Here's another group I know absolutely nothing about, but I admire the fact that they're not just singing the same kid's songs. They do sound a bit too "white and nerdy" to be singing "The Banana Boat Song" though. They sound like they're enjoying themselves however (especially on "The Erie"). Hope you enjoy it too!